The Waltham Watch Company, also known as the American Waltham Watch Co., contributed greatly to the precision engineering of watch making machines. In operation from 1852-1957 many fine specimens of pocket watches came out of the Waltham factory. The vision of the company’s founders was to produce watches with machinery using interchangeable parts. By the early 1870s Waltham watches were winning prizes all over the world. Through production Waltham found that even though they were using interchangeable parts, each watch was still unique and required its own corrections. We love the fact that every Waltham pocket watch has its own delightful peculiarity. We are dedicated to preserving the precision engineering of each and every Waltham pocket watch that comes into our specialist workshop. Our Master Watchmaker understands the intricacies of each unique mechanism and is an expert in the repair and restoration of all vintage Waltham pocket watches. We know it is a privilege to work on such fine specimens of engineering, and we love nothing more than to bring an antique Waltham pocket watch back to life. We offer an antique Waltham pocket watch repair service, which is carried out by our Master Watchmaker. An expert in Waltham timepieces, our Master Watchmaker is able to diagnose and sensitively restore any Waltham pocket watch to its former glory. We understand that restoration and refurbishment work on antique Waltham timepieces requires a delicate hand. Our Master Watchmaker not only specialises in the repair of Waltham pocket watches, he is one of only ten watchmakers holding the Master title of excellence in the UK. Master Watchmakers gain their title through years of experience mastering the intricate techniques required to repair complicated watch movements and mechanisms, so with us you can be sure your Waltham pocket watch is in good hands. We can usually source original parts for many Waltham models to keep your vintage timepiece’s value, but when necessary our Master Watchmaker can extend his experience to handcrafting the required part to get your Waltham pocket watch working perfectly. We are a highly competent Waltham pocket watch refurbishment service you can trust. We are proud to work on any vintage Waltham repair. Our Master Watchmaker has exceptional knowledge about all vintage pocket watches and offers exquisite craftsmanship. 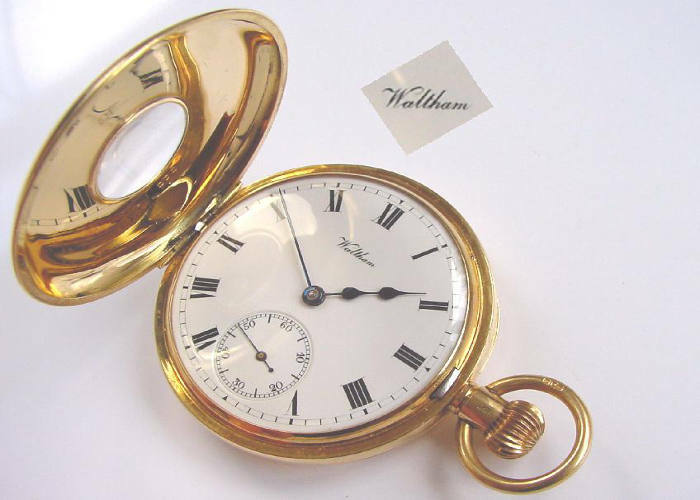 We are confident we can get your Waltham pocket watch working with the precision for which it was designed. We can carry out a service of the movement through to a complete refurbishment of the case. We know how important your Waltham pocket watch is to you. That is why we promise to take exceptionally good care of your timepiece and carry out repairs and restoration work with the utmost sensitivity and expertise. We are absolutely confident you will be delighted with the results of our outstanding Waltham pocket watch service, but for peace of mind we offer a minimum 12 month guarantee for all work undertaken. You can ship your timepiece to us from anywhere in the UK using our Royal Mail Special Delivery FREEPOST service. Your pocket watch is insured for up to £20,000 throughout its postal journey from the moment the package leaves your hand to when it is posted back to you. When we receive your pocket watch we will discuss the repairs required and the costs involved before we begin any work. We would love to repair your Waltham pocket watch from anywhere in the world. Outside of the UK you will have to organise shipping, other than that you can expect the same exceptional repair service by our Master Watchmaker. Feel free to bring your Waltham pocket watch into our Lewes showroom. We would love to meet you and discuss your vintage Waltham pocket watch repair requirements with you. Please do not hesitate to contact us with any queries regarding our Waltham pocket watch repair and restoration service, or fill in the FREEPOST Envelope Request Form.